What is a cowboy keyboard? It's a cowboy or Western design printed directly onto a computer keyboard. These cowboy keyboards are not "skins" or covers, but are computer keyboards with beautiful, unique designs printed directly on them. Compatible with a PC or Mac, the keyboards connect to your computer with the included USB dongle......just plug and play! For more information on USB dongles and keyboards, please scroll down beneath the keyboards for sale. Below: The Arizona Cowboys keyboard, just one of the cowboy designs available on a keyboard from Zazzle. Have a 102 key layout with numeric pad. Work with either a PC or Mac. However, we don't guarantee any information you see here to be accurate. When considering ordering a keyboard or any other item from Zazzle read the product description for the latest and most accurate information. When looking at a keyboard on Zazzle, you may notice in the description it says something like: "Easy plug and play installation with included USB dongle." So, what's a dongle? A dongle is a small device that is connected to a computer, thereby allowing wireless communication between the computer and something else. Dongles, for example are commonly used to allow a computer to communicate with a mouse or keyboard. In the photo below a dongle is laying beside a laptop computer. 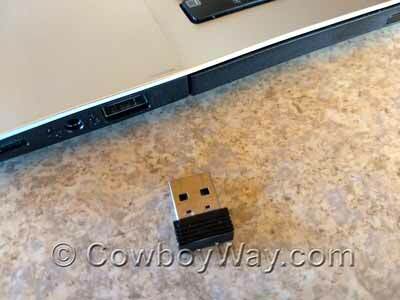 When plugged in to a USB port, this particular dongle allows the laptop to wirelessly communicate with a mouse. Dongles are also commonly used to allow computers to wirelessly communicate with keyboards (like the keyboards on Zazzle). Below: A dongle laying beside a laptop. Not all dongles look the same, so other ones could look different than the one shown here. Below: The same laptop and dongle as shown above. 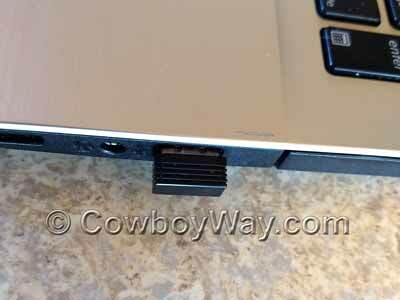 Now, however, the dongle has been inserted into a USB port.